Growing in Grace Podcast: 356. Covenant Confusion #6: The Red Letters...Old Covenant or New? 356. Covenant Confusion #6: The Red Letters...Old Covenant or New? The "red letter gospel" is a phrase used in reference to the words of Jesus which are printed in red letters in many Bibles. Although the life of Jesus appears in the New Testament, Jesus was born under the law and would often minister the law to those who were under it. This was the purpose of the law, it was a tutor that taught it was impossible to meet the requirement of righteousness by trying to keep Old Covenant commandments. In order for a will and testament (covenant) to take effect, the testator had to die. Therefore, it was after the death of Jesus that the 1st (temporary) covenant was replaced with a new and everlasting one. 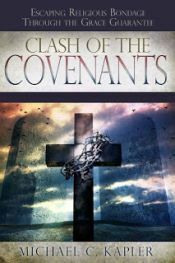 As we rightly divide the covenants, keep in mind not everything Jesus said was for you personally because He was ministering to people under a covenant that is now obsolete.